Crane Development Awarded Historic Tax Credits to Rehab Former Auto Parts Factory — Crane Development Ltd.
Toledo, OH – December 12, 2018: Today, the Ohio Development Services Agency awarded $250,000 in Ohio Historic Preservation Tax Credits to Matthew Rubin, 29, of Crane Development, to rehabilitate a vacant, historic building at the corner of 10th Street and Jackson in downtown Toledo. The distressed, 15,000-square-foot, three-story building will be transformed into high-quality Class A office space with 1st floor retail. The property includes a 32-car attached parking lot. The building construction is being managed by Julia Randles of Randles Company. Kate MacPherson, AIA of MacPherson Architects is the designer. Crane Development is currently marketing the space to potential tenants including law firms and business services firms. Built in the late 1800s, the building was formerly home to Toledo auto parts manufacturing companies Landers Brothers, Tillotson Manufacturing and M.I Wilcox. The building also served as a lodge for the local chapter of the Independent Order of Odd Fellows. The building is significant in terms of both the history of commerce and the history of transportation in Toledo, and at the national level as it relates to the rise of the automobile industry and the Jeep. The City of Toledo designated the building as a local historic landmark on July 31, 2018. It is currently in the process of being nominated for the National Register of Historic Places, which will make the project eligible for Federal Historic Tax Credits. Erin Claussen of Toledo Revival serves as the lead historic preservation consultant for the nomination and tax credit application process. 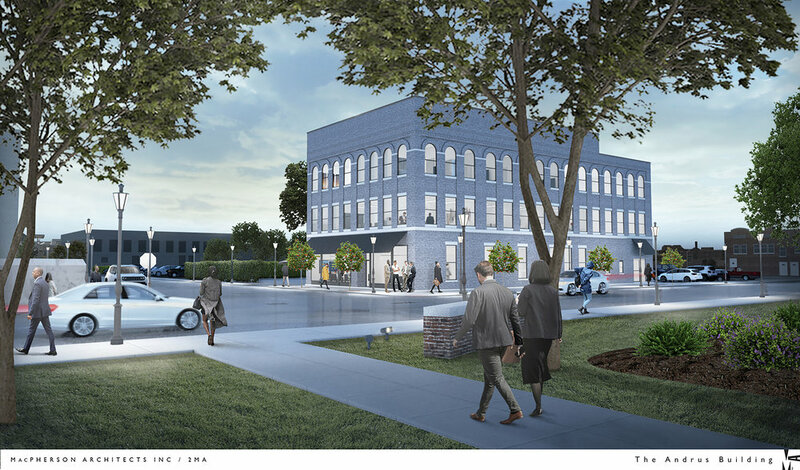 Rubin and Claussen were both awarded Emerging Professionals Scholarships by Heritage Ohio in 2017 for their previous redevelopment work in Toledo. The Andrus Building project is being supported by many local partners including The City of Toledo, LISC-ProMedica partnership, Toledo-Lucas County Port Authority, ConnecToledo and the Uptown Association. “By using historic tax credits, we are bringing more economic opportunity to downtown and preserving a piece of Toledo history from an era of craftsmanship that cannot be recreated,” said Rubin.